These superbly crafted stools combine the elegance of fine furniture with the strength and functionality needed in a busy household. They'll quickly earn a place of prominence in your home - and become heirlooms for generations to come. The perfect 'library step': you'll love it just like these folks! 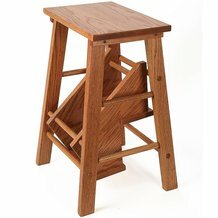 This stool is beautiful and useful. However, it is VERY narrow side to side and would be dangerous for anyone who did not watch every step that they took. I am aware and will be careful. We purchased the oak step stool.....such wonderful craftsmanship! It is being used in our oak living room as a way for our kitties to reach their windowsill sun perch. The box arrived promptly and securely wrapped. Great service......wonderful product! We would not hesitate to shop Lehman's in the future. I bought one and, after seeing and feeling the superb U.S craftsmanship, bought a second! I love this stool! It's even more sturdy than I expected it to be; it's very well-built. The finish is very nice (a bit lighter than my computer monitor shows), and the seat/top step has a durable finish so I don't have to worry about shoes marring the finish. I'm giving it four stars because the wood plugs don't sit flush with the stool legs, and also the feet could use some felt pads. But otherwise it's a nice multifunctional piece of furniture that will last a long time. And I love that it's made in the USA. Ordered this when we updated our kitchen. Arrived safely packaged, in perfect condition. Beautiful smooth finish while sturdily built. I keep it in the kitchen to safely reach upper cabinet shelves. Even standing on the top, it is perfectly steady, not uneven or rickety. Although it is expensive, I expect it will last many years. Looks beautiful in my kitchen and will save me the cost of the broken leg I probably would have eventually endured climbing on my rickety old stepladder! It's just wonderful ! This is a beautiful piece of furniture, with a satin finish that showcases the natural wood grain. Even the dowel parts are oak. I admire the craftsmanship every time I use it (often, since it's in the kitchen), especially the smooth frictionless movement when you pull out the steps. It even smells good! Did I mention functionality? After years of climbing on a rickety bar stool to reach my top cabinet shelves, this is reassuringly sturdy. I received my oak stool well packaged and on time. It was everything I was looking for. It looks great in my new kitchen, easy to use, can reach the top shelf of 36 cabinets without difficulty. I just added felt to 6 feet so as not to scratch my hardwood floors. I would recommend this product it is sturdy and well worth the cost. Lehman's service is unmatched as far as I am concerned. We just ended up doing a complete upgrade of our kitchen.It took us almost 3 months. We have 2 tall pantry cabinets on both sides of our brand new refrigerator. So we needed some thing like this stool to reach up there. I was looking for it on the web. Even though this website said it was on back order, they still delivered it very fast within a week. Thanks! It is very well made and my wife loves this thing, since she is only about 5'1 tall. Also, since I have hardwood floor in my kitchen, I have installed non-scratch padding on all legs. It is little bit on pricey side but it is very well worth every penny. This is a great addition to the home! 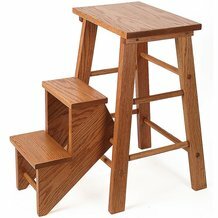 A beautifully crafted Oak stool, made for sitting, and a step-stool when you need it! Foldable steps compact underneath the stool when not in use, nothing to trip over!